Congratulations, Dawn! You've just won an autographed copy of INSUFFICIENT MATING MATERIAL! Please email me your name and address to sfrgalaxyNOSPAM@gmail.com (and don’t forget to remove der “no spam”). The Galaxy Express: Discuss boundaries in genre fiction like science fiction romance, and why they should be nudged, pushed, or smashed to bits (take your pick). Rowena Cherry: Discuss? Wow! You start deep, Heather. “If you would converse with me, you must first define your terms.” I believe the author was Voltaire, but I’ve seen a variant attributed to John Locke. Anyway, if you exclude from consideration misquotes from rock songs (such as “I’m Gemini and I don’t know which one I like the most” or “Oh, God, I could do better than that!”, Voltaire’s was my favorite quote when I was at University (Cambridge). The word-geek pedant in me wants to define the premise, before I discuss it. For a start is science fiction romance a genre? It should be! But is it? As I see it, the biggest boundary is that SFR is a sub-genre. We come under the umbrella of Paranormal. I like to think of Paranormal as either a great big hairy werewolf, sitting on my SFR head…. not on my face!... or as a mother hen with assorted, mismatched chicks under her wings. Contest categories could be seen as a micro-example of the problem. If the class isn’t for all “FFandP” (or Fantasy, Futuristic, Time Travel and Paranormal) with no mention at all of SFR or RSF, then it’s Futuristic, Fantasy, and Sci-Fi Romance. The PEARL Awards are pretty much the gold standard, I would say. Other contests probably should not be pitting sweet, winged faeries, or Middle-Earthian warriors, or Arthurian druids against high tech gods from outer space, aliens or space-faring Terrans, or modern day descendants of classical gods. For contest and award purposes, the boundaries should be redrawn. There aren’t enough awards and prizes to go around. As for shelving issues in bookstores, the business isn’t exactly booming, so I can understand why there’s Science Fiction, and there’s Romance, and it is up to the movers and the shakers in the bookselling world to decide (often based on cover art and cover blurb) what is what. Online… well, if SFR authors were to organize, and tag, and list, and help each other, I’m sure online stores and book networking sites could break out every subgenre by content, but I’m an eclectic reader. In fact, I find it rather unhelpful that some authors use different pen names if they write in different genres. But that is completely OT. TGE: You're a consummate researcher, so much so that George Orwell would be proud. What's the most gag-inducing, gross out fact you ever uncovered in the name of science fiction romance? RC: Thank you for the well-researched compliment. If it’s truly gag-inducingly gross, it probably wasn’t uncovered by me. 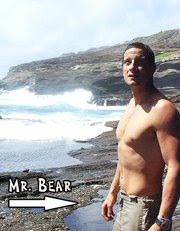 One or two of Bear Grylls’s survival exploits come to mind…Are you sure you want to know? Wringing out an elephant’s dung for an emergency drink would be one. Drinking the liquor from one of a dead camel’s stomachs to quench ones thirst would be another. And, spending a cold desert night inside a dead camel’s abdominal cavity (very much like what Han Solo did on the ice planet) would surely qualify. I don’t think I’d exactly gag at the thought of chiggers in the absorbent moss that I’d need for my sanitary protection if I were stranded on a tropical island for months on end, but that’s pretty gross. “Survivorman” Les Stroud told me that my marooned alien hero could use rabbit entrails for a condom. My inner heroine thanks you for that, Les! If one had a proper condom, it would be too valuable as a container to store water in to be used for its advertised purpose. Yes...there you go. I do think I might gag if I had to drink from a condom. TGE: If a canderu fought a piranha, which predator would win? 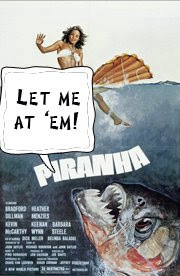 RC: The piranha, if they fought. A canderu is a stealth predator. It is attracted by the delicious scent of urea, usually in the gills of its normal prey, and it wriggles in and attaches itself using spines that don’t retract once deployed. On rare occasions it has been attracted to the flow from an unwary human relieving himself in the river, and has swum upstream, you might say. Hence the canderu’s other name, “willy fish”. TGE: You stated in a past interview that "For me all plot begins with the hero." Ever think you might challenge your conventions and do the opposite—start one with a heroine? Why or why not? RC: Not as long as I’m writing Romance. I don’t write about the heroine I want to be. I write about the larger than life, fantasy male that I’d like to imagine falling in love with me. If my hero doesn’t grab me, and hold my attention, I doubt that my reader will want to take him to bed with her. If I were writing something else, I might. TGE: What was your inspiration for launching the Alien Romances blog? RC: Blogging was the latest wave when I started the “Alien Romances” craft blog. Not everyone was doing it, at the time, and individual blogs were still seen as time-consuming and too much of a distraction. My inspiration was partly out of a desire to promote the SFR genre, partly “Pay it forward” thinking, and partly sheer competitiveness. I knew that if I didn’t do it, and grab the “alien romances” title (and the pick of the best SFR authors of our time), Deidre Knight—or someone as savvy as she is—would do so. Science Fiction Romance wasn’t as “big” as it is now, and some of the authors I initially invited weren’t available. Members of the blog are Susan Kearney, Linnea Sinclair, Jacqueline Lichtenberg, Colby Hodge, Margaret L Carter, Susan Sizemore, myself. We also have hosted Susan Grant, Barbara Karmazin, and Stacey Klemstein. TGE: Please share a little known fact about your creative process. If there are any little known facts about my creative process, they probably don’t redound to my credit. I’ve compared writing one of my books to doing one of those fiendish 1,000 piece jigsaws where several pieces are all black and almost exactly the same shape on at least two sides. TGE: This has nothing to do with SFR (on the surface, at least), but isn't The Turk, like, the coolest automaton ever? RC: Very cool, not least because it was such a successful hoax. Thank you for sharing. Thanks, Rowena for your generous time and being so game! Now it’s time for the third giveaway! Winner #1 will receive an ARC of KNIGHT’S FORK, which means you get to read it about two months in advance of the release date. (Rowena, if you’re around, we’d love to hear more about the book, the cover, or anything else you’d like to tell us about it! And thanks for your generosity). The Queen Consort of the Volnoth needs a sperm donor, and only one green-eyed god has the right stuff. Little does she know she has pinned all her hopes on the crown jewels of the fabled Royal Saurian Djinn. Not only is he the son of her greatest enemy, but he has taken a vow of chastity. Taking the wrong lover...in the wrong place, at the wrong time...is dangerous. And when the High and Mighty Intervene, it can be fatal. Can true love and a pure White Knight’s virtue triumph, when society loves a right royal scandal? Winner #2 will receive a copy of INSUFFICIENT MATING MATERIAL! In order to get your name in the hat for a random drawing (contest limited to U.S. residents), please leave a comment for this post. Perhaps you’d like to share your own survival exploits! The deadline is Sunday, July 27, 2008, at 9 p.m. EST. And before I sign off, I wanted to mention that The Romance Studio is asking “Which author has what it takes to be the first TRS Studio Diva?” The esteemed Ms. Cherry is on the list, and the link takes you right to the voting page (hint, hint). Thank you, Rowena Cherry, for allowing us a glimpse into your amazing world.